If you would like to live in well-built newer home, with limited yard maintenance and access to Golden Eagle Country Club, then consider the Glen At Golden Eagle as a great alternative to similar Eagles Ridge. 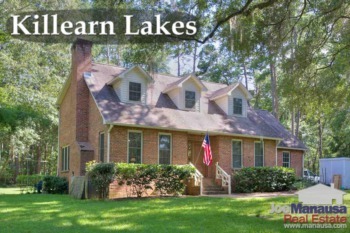 This popular NE Tallahassee neighborhood contains homes constructed between the years of 1997 and 2006, and they are smaller but filled with the amenities often found in high end homes. As many of these homes were built and sold during the expansion phase housing market 15-18 years ago, normal move cycles for many of the homeowners occurred just as the housing market began to crash. Compound that will fallen values and we expect to find significant pent-up supply in the Glen at Golden Eagle. 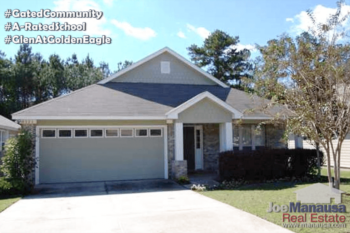 In this report, we will look at prices, values, and sizes of homes in the Glen At Golden Eagle, as well as show current listings in the Tallahassee MLS and all closed home sales going back to 2002. For the three real estate graphs found below, you will find the number of closed home sales for each year (blue columns, measured on the left vertical axis), and an important real estate statistic shown in red (measured on the right vertical axis. It is important to note that sales are through December for all previous years, but through February in 2015. Average home prices fell negligibly in 2014, but are still 10 percent higher than the low established in 2012. Distressed sales are are occurring at a higher than average pace when compared with other neighborhoods in Tallahassee (4 of the past 12 sales have been distressed). The average recorded sales price was $180,000 for the Glen At Golden Eagle in 2014, but up to $192,167 thus far in 2015. Home sales activity last year was consistent with what we have seen over the previous four years, but still far below what will be needed for the Glen to enjoy its own housing market recovery. In 2014, there were 9 closed home sales in the Glen At Golden Eagle, and three already in 2015. Average home values in the Glen At Golden Eagle fell 4% in 2014, but they are still up 10% when compared to a low set back in 2012. Through February of this year, the average value of a home sold in the Glen At Golden Eagle has been $112 per square foot. This is down about 24% from the market high set back in 2006. This means that many homeowners who have purchased or refinanced in the past 8 years are likely at zero or negative equity situations. The average home size sold in the Glen At Golden Eagle typically falls in a range of 1,500 to 1,700 square feet, but the three homes sold this year have soared above this range. The 3 sales thus far in 2015 have averaged 1,716 square feet. Just as we have warned with other "boom neighborhoods," we need to keep an eye on inventory in case a bunch of people decide to sell at the same time. If you have a vested interest in the Glen at Golden Eagle (or would like to), just keep a close eye listings as they occur. If 10 or more homes hit the market at once, it might be a sign that the pent-up supply needs to vent. The following list of homes are the most recent listings in the Glen At Golden Eagle. The following list shows home sales going back to 1997 in the Glen At Golden Eagle. I hope you enjoyed our March 2015 update on home sales in the Glen At Golden Eagle, please feel free to drop me a note if you have questions not covered in this report.